The redesigned Chevrolet Camaro will go on sale across Europe towards the end of this year, with prices in the UK starting from £35,320 for the entry-level coupe. Prices for the convertible in the UK start from £40,320, and UK customers can look forward to taking delivery of their new Camaro as of November 2013. The facelifted Camaro is identified by its revised exterior appearance with tweaked aerodynamics, allowing for more efficient cooling and stability at high speeds. There's a wider lower grille and a narrower upper grille, while the functional hood vent helps reduce heat and aerodynamic lift. At the rear, a sculptural deck lid, horizontal lamps and diffuser complete the facelift. 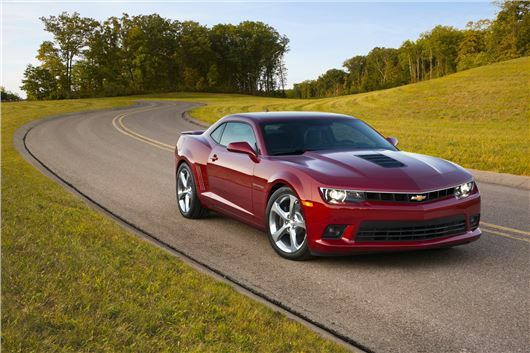 The Camaro's 6.2L engine produces 440PS in manual form, and 410PS with the automatic transmission, which has TAP shift functionality. Remote keyless entry is standard, and customers can opt for remote engine start functionality on the automatic variants. Chevrolet MyLink technology comes as standard, with a seven-inch touch-screen, rear-view camera and a voice recognition system that, together with the new colour heads-up display, helps drivers keep their eyes on the road and hands on the steering wheel. An optional navigation system, with Europe wide coverage, is available. 6.2L .. At UK prices.. deep pockets and access to plenty of petrol is a must! !